How Is the Electric Smoker Different? What Food Can You Smoke? A no-fuss device will provide you with quick and easy access to smoked meats and make it a fun and enjoyable activity. Whether you are a first-time smoker or an experienced one, an electric smoker that can be used intuitively without complicated and difficult steps is a good choice. Both the exterior and interior appearance of a smoker are important. Aside from the aesthetic factor, the appearance often indicates durability and workmanship. Well-made electric smokers use stainless steel or chrome-coated materials and are designed to maximize its smoking capability. To keep your electric smoker in good working condition, it will require proper cleaning after every use. A lot of people go for smokers with easy to remove trays and racks, that can be easily wiped clean, and do not require any special cleaning solutions. How often you plan to cook, what you plan to cook, and for how many people will affect your buying decision. A smoker with a large capacity will provide you with more flexibility and allow you to cook bigger portions of meat. Digital or analog refers to how heat and temperature are controlled in the smoker. They both have pros and cons and differ in terms of cost and reliability. Digital smokers are generally better at maintaining temperature than analog ones, although they are also a bit more expensive. This smoker has a fully-insulated body with four chrome-coated smoking racks, an adjustable air damper for smoke control, and a patented side wood chip loading system. Temperature, time, and on/off can be controlled via the digital control panels. Its integrated thermostat temperature control ensures even, consistent smoking. This smoker comes with an instruction manual, but it might be a bit challenging for newbies to use. It has no remote, no wheels, no viewing window and no internal light so it can take a while to get used to. It is made with dual finish stainless steel with a glass door and a large, stainless steel locking hatch for a smoke-tight seal. It has an insulated, double wall construction. Other features include an advanced control panel with easy-read, blue LED display and a removable food thermometer. This smoker has a relatively low smoke production and beginners might find it a bit technical due to the assembly required. Wear and tear can make the wood chip bin challenging to remove and transport can be tricky because wheels are not included. It is also fairly expensive. This smoker allows smoking up to 100 lbs. (45.36 kg) of food due to its spacious cooking space of 730 sq. inches (4709.67 sq.cm) with four chrome-coated smoking racks. It has an RF remote control that monitors temperature, time, internal light, on/off, and meat temperature. Even cooking from 100 to 275 degrees F (37.78 to 135 degrees C) can be achieved with its thermostat temperature control with a built-in temperature probe. It has convenient side wood chip loader, removable drip pan, top air damper, viewing window, and internal light. This smoker is not very portable and cannot be moved easily. There is also no timer. While the internal light and large viewing window allow you to see inside, it becomes difficult to see through while the food is still smoking. Smoking is similar to grilling. However, unlike direct grilling, the smoking process involves cooking the meat slowly, over low heat, and with the use of smoke. A smoker is, therefore, similar to a grill with the ability to create delicious meals by allowing the smoke to work its way into the meat. Smokers are often categorized into three basic types: electric smokers, gas smokers, and charcoal smokers. The main difference between these three types is their source of heat. Electric smokers use electricity, gas smokers typically use a propane tank, and charcoal smokers make use of different types of charcoal. Electric smokers are great for beginners because they are easy to use. The temperature is set at the start and consistently maintained, requiring little attention while the smoker is in use. Gas smokers are fairly easy to use as well. The use of a propane tank allows heat to remain steady and consistent, with the added perk of using it even without electricity. Charcoal smokers require more expertise because you’ll need to learn about different types of charcoal to use, as well as how to start and maintain a fire. However, charcoal smokers produce better flavors. From these three main types of smokers, there are also variations or sub-categories that give rise to numerous types of smokers. Some of these smokers you will find available in the market are vertical water smokers, horizontal offset smokers, box smokers, drum smokers, smoker ovens, kamado grills, pellet smokers, and stove-top smokers. The appeal of smoked foods is in their distinct flavor. But smoking is not the only way to get that smoky taste. You can add what is called “liquid smoke” to your food. These are condensed particles of smoke produced from burning wood at high temperatures. Electric smokers can be either analog or digital. Digital (thermostat-controlled) or analog (rheostat-controlled) refers to how heat and temperature are controlled in the smoker. One of the biggest advantages of using electric smokers is that they are very easy to use, making them a great choice for beginners. There is no need to learn how to start or maintain a fire – you only need to flip a switch and you can get right to smoking. It also requires very little attention. Once you’ve set up and started your electric smoker, you only need to come back to it when it is done. For water-based smokers though, you will need to check that the water does not dry out. Electric smokers are also usually portable and you can use it both indoors and outdoors. The drawback to setting it outside is that you will need to have an electrical outlet nearby. You will also have to watch out for rain. Unlike with non-electric smokers that you can dry and then use again, electric smokers have wirings and electronic controllers that will get damaged if exposed to moisture. Some people get the impression that electric smokers are pricier than other smokers. Although this may be generally true, there are also affordable options depending on the brand and model you choose. Using an electric smoker can also be problematic at times when it is cold or windy outside because it may make it hard for the electric smoker to get the right temperature. You also can’t expect to get a decent smoke ring from an electric smoker because this normally requires fuel combustion. The most common type of food cooked in any type of smoker is meat. The type of meat to use can be largely due to personal preference. Generally, though, meats that are considered good or expensive, such as steaks and pork tenderloin, should be kept off the smoker because you don’t want to “waste” these. These are best cooked simply and on a grill. The best meats to cook in an electric smoker are classic cuts of barbecue meat that are usually tough, chewy, and difficult to cook in any other way. Some examples are beef brisket, pork shoulder, and ribs. These cuts are relatively inexpensive and forgiving, which makes them the perfect ones to experiment with in the smoker. Fattier cuts of meat also work well with the low and slow method of electric smokers. Smoking these allows the fat to melt as the meat cooks, producing tender meat that falls off your fork and melts in your mouth. You can also try smoking whole hens or chicken quarters, lamb shoulders or leg, salmon, and even sausages. Meat is definitely not the only type of food you can smoke in an electric smoker though. It is not unusual to smoke salt, nuts, and even fruits and vegetables such as potatoes, asparagus, cauliflower, eggplant, pineapple, cherry tomatoes, portobello mushrooms, and more. Just be mindful of the time when you try to smoke these because vegetables and fruits take less time to smoke than meat. When smoking vegetables, fruits, and meat together, you have to be wary of cross-contamination. Always put the vegetables and fruit on the upper rack, above the protein. This way you can avoid undercooked meat drippings from going on your vegetables and fruits. In the bottom of an electric smoker, you will find a heating element, a water or grease pan, and a wood chip tray. When heated, the wood chips produce smoke that will eventually give the meat a special taste and flavor. There are many different types of wood chips you can choose from and what you choose determines the flavor of your meat. Generally, you can use any kind of wood for smoking except for pine and cedar. Just take note that the wood has to be well-seasoned and dry. Green wood will ruin your smoker. Below you will find a list of some of the most common types of wood chips and what food they are best used for. The wood that you can use in electric smokers does not only affect taste and flavor. The type and form of wood used can also determine the intensity of the smoke and flavor. The wood used in electric smokers can come in two forms – wood chips or bisquettes. Wood chips are the most commonly used in electric smokers. They are readily available in hardware or barbecue stores and online. Electric smokers have a wood chip box usually set on top of the heating element and this is where wood chips are loaded. A lot of the electric smokers allow the use of dry chips only although there are some that allow both dry and soaked. Dry wood chips burn faster, producing an intense smoke compared to soaked ones and resulting in a faster cooking time than if you used soaked wood chips. Flavor is likewise affected by the amount of smoke your food gets, so smoking with dry chips gives your food a more intense flavor than with soaked chips. Bisquettes, on the other hand, are discs composed primarily of compactly-pressed sawdust. They are only about two inches (5 cm) in diameter and a half inch in thickness. These bisquettes normally burn for 20 minutes and produce milder smoke compared to wood chips. Bisquettes are pricier than wood chips and they are currently only manufactured by Bradley Smoker. The bisquettes in the Bradley Smoker are self-loading and produce continuous smoke which is automatically extinguished to prevent gas and acid formation that can distort taste. There are currently nine flavors of bisquettes available, but the downside is that you have no choice but to buy them solely from Bradley’s. You can learn to make your own bisquettes. This involves using a homemade press and requires woodworking skills but if you are into DIY and wish to save on a lot of money then this is something that could be worth trying. Ease of use is highly dependent on your lifestyle and on your level of expertise when it comes to smoking food. If you are still a newbie, then it would be best for you to choose a smoker that is easy to assemble with simple instructions for use. Most electric smokers are now easier to use due to technology. Some models come with a remote control, wireless connectivity, and digital timers to make the smoking process a lot more convenient and stress-free for you. When it comes to appearance, it’s not all about how beautiful the smoker looks on the outside. It has more to do with the materials used in its construction, its durability, and its features. Electric smokers are generally known for their durability. However, check the workmanship and see if the product has sharp edges, sturdy legs, and wheels. Does it have moving parts that will last? Is the paint rustproof and waterproof? Check if the material used can absorb heat and distribute it evenly. Does it have doors and dampers that close tightly? The last thing you want to do is to spend hours of cleaning after you have cooked and consumed all that delicious smoked food. While cleaning the outside may be optional and can be done occasionally, cleaning the inside is a must because fat, seasonings, and juices from the food will drip off and splatter all over. This can become a breeding ground for bacteria. Check to see if the smoker is made of stainless steel because it is the easiest to clean. How easy is it to remove the racks for cleaning? What about removing ash? Before you make that purchase, ask yourself if you are willing and able to handle all the cleaning it will involve. Ask yourself how often you wish to cook, what types of food you plan to cook in it, and for how many people. If it is just for you and another person, then all you need is a small smoker. But if you plan to cook for a whole party and do it often, then you need a smoker with a bigger capacity. Don’t forget to take note of the width of the racks. Some slabs can measure up to 16″ (40.6 cm) so you might need to cut it in half if you have narrower racks. If you plan on cooking turkey, headspace is also something you need to consider. What we are really comparing here are rheostat-controlled smokers (analog) versus thermostat-controlled smokers (digital). A rheostat restricts the amount of electricity that can flow to the heating element and you can choose from low, medium, and high heat. This does not control the temperature inside the smoker. Its advantages are cheaper costs, ease of use, and reliability because they don’t break easily. However, it’s harder to control the temperature inside the smoker. A thermostat, on the other hand, allows you to set and control the temperature and forget about it. They can be costly though and reliability can be questionable depending on storage and handling. This electric smoker has a good set of features for its price, making it the cheapest. Its digital control panel makes it easy to control temperature, time, and on/off. Smoke can be easily adjusted with its adjustable air damper, providing even, and consistent smoking. Its wood chip loading system is located along the side, making it easy and convenient to add chips while in use. With more advanced features and affordable price, this electric smoker is your best bet. Its dual-tone finish stainless steel and glass door make it easy to clean while its large, stainless steel locking hatch ensures a smoke-tight seal. The removable food thermometer is an excellent add-on and the advanced control panel has an easy-to-read, blue LED display. 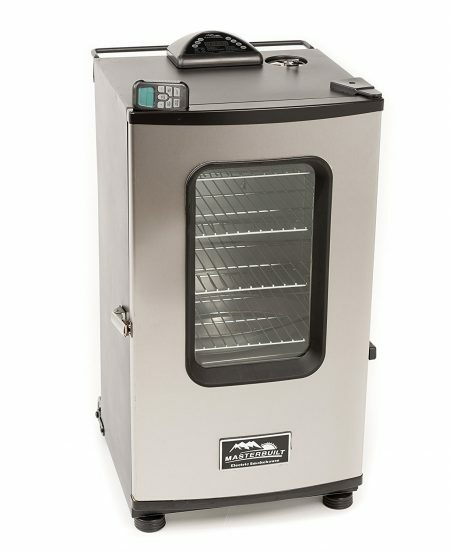 This electric smoker boasts of advanced features such as an RF remote that controls and monitors on/off, time, internal light, temperature, and meat temperature. Its 730 square inches of cooking space allows smoking of up to 100 pounds of food. It is convenient and easy to use with its side wood chip loading, removable drip pan, and top air damper. Vegetable oil is one of the most commonly used cooking oils in households these days. However, there are several issues surrounding them with regard to whether they are good for our health or not. Choosing what cooking oil to use can become quite daunting because there are so many options available. Since mushrooms are very delicate, storage plays a critical role in how long they will last. There are very specific storage techniques that you must learn to help keep them fresh and make the most out of them. Everything you need for your home, office, work, and lifestyle. Our goal is to help you live a better and happier life by providing you with some of the best content online. Get exclusive content, advice, and tips from AboveHouse delivered to your inbox. © 2018 Above House, All Rights Reserved. AboveHouse.com is a participant in the Amazon Services LLC Associates Program, an affiliate advertising program designed to provide a means for sites to earn advertising fees by advertising and linking to amazon.com.